I was 27 the time i registered my PhD study. The aim was clear that time; to get my doctorate by the age of 30. I've always been an ambitious type of person. I never live my life without dreaming. Every second of my time is about dreaming to be everything and anything that is possible. Anyway, dream has always be a dream. Who am i to hundred percent guarantee for all my dreams to come true. I finished my PhD at the age of 31. 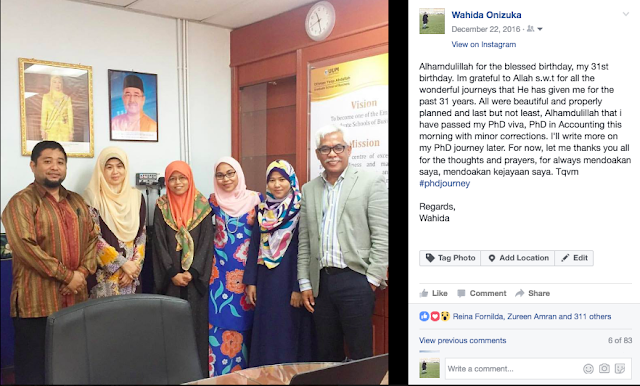 Exactly 31, as my viva date was on my birthday (22/12/2016). I started my PhD on September 2012 (a year after i finished my master degree). First thing i did was to contact the potential supervisor for my PhD study. Upon the approval of the potential supervisor, I proceed with the study application. I had to agree to manage time between working as a full time lecturer and also as a part time student. I knew it was impossible for me to get study leave from the dean as i was considered as new lecturer and ofkos, the senior will have the chance first. So, I had decided, while the study momentum is still there, I shouldn't waste my time. That was the first reason why I started my PhD. 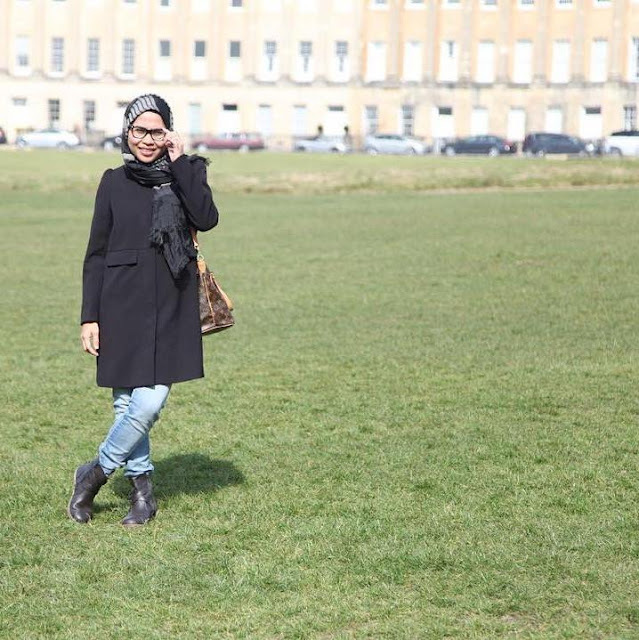 It was totally burdensome actually to manage time between teaching, administrative works, taking care of the child and family, taking care of the family and siblings matters, and to look after my business while doing PhD. But there was no ways for me to quit and even thinking to defer my study. I never did things halfway in my life, so I continued. With the bless of Allah, everything will be easy insyaAllah. That's the only strength I held with me that time. During the first year of study, the study progress was not properly managed. I was busy organizing International Conference on Business Innovation, Entrepreneurship and Engineering (ICOBIEE2013) held on December 2013. I was the conference director. I had spent time to take care of the conference. 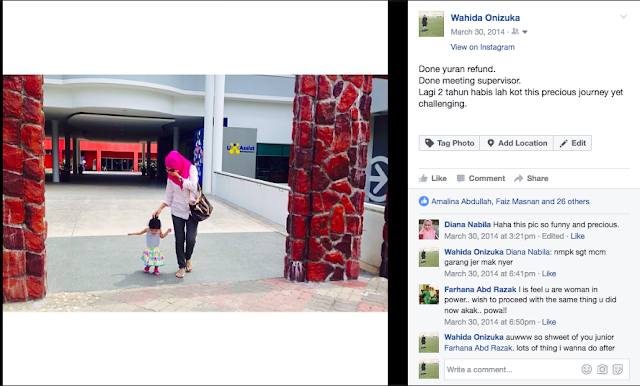 Early 2014, after so many disgrace happened to me for the conference held, I was determined to focus on my PhD study. I was thinking that nothing I can do to improvise myself except doing something that can give credit to myself personally. I put an effort like hell for the conference, but still being humiliated by some people for their own reasons. Thanks God for the event, at least I back to track to further progress my study. 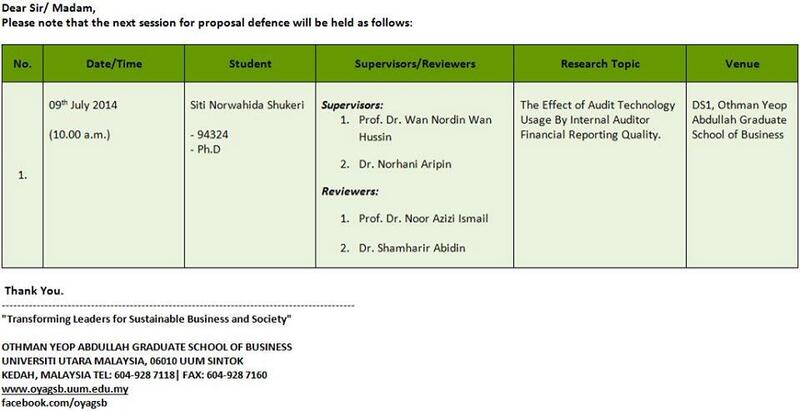 So, in July 2014, I have defended my research proposal and passed with minor correction. The proposed PhD research was actually different to my finalized thesis for some reasons. I have to change my research method, following my supervisor's advice and I had ignored the survey instrument, the first method that I wanted to do earlier. I never did research based on survey instrument in my life, but I didn't know why I came up with such during the defense proposal. So in end of 2014, I started collecting my full data from the annual report. I took about 6 months to have all data complete with the helps of my PhD colleague Ameen and Dr Hassan. 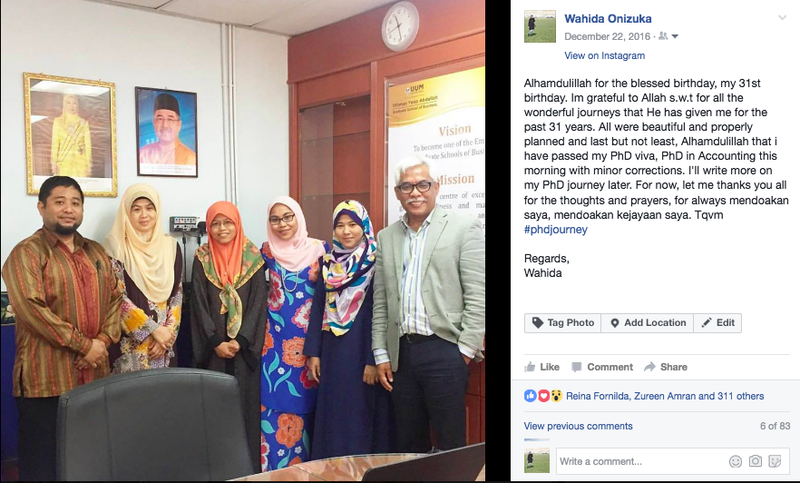 I was very fortunate to have research environment surrounded with knowledgeable experts within my research area and the first expert that I'm referring to is actually my first supervisor, Prof Dr Wan Nordin Wan Hussin. Without him in UUM, I don't think I'll ended up there for the past 4 years. I knew that he used to be a very meticulous type of person but I need that type of person to ensure my thesis goes well. True when people once said, you can't struggle your PhD journey alone. You need people who can support you and research wise,again I'm lucky to have Dr. Hani, Ameen, Dr Hassan, Dr Intan and Dr Wan Sallha who have helped me a lot in terms of statistical analysis, and data shared. Thanks Allah, my PhD journey was easy and smooth. I don't think my PhD was a trouble and difficult one for me. Allah has helped me a lot throughout the journey which sometimes, I never believed that I had survived my highest degree. I remember when I did may master, I was telling my husband, if I finished my master, I would want to jump high to the sky, and now Allah has blessed me with PhD degree (I don't jump at all). Alhamdulillah. Among many despairs happened especially dealing with family matters, there is a blessing in disguise. During my PhD study, I have 3 brothers in prison, my parent divorce, I have to take care of my two brothers who are staying with (Form 5 & 3) and have to visit and revisit them in prison to let them know, I will never leave them apart. Never in my life. 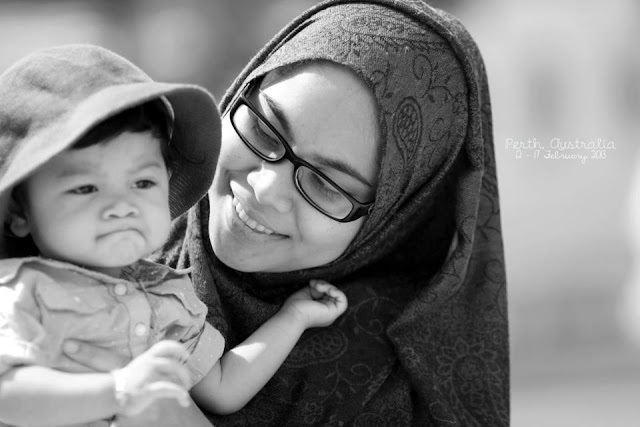 In May 2015, I delivered my second baby - Wan Khalish Akif. Glad that I have done with data collection before the delivery date. In March 2016, I have attended British Accounting and Finance Association (BAFA) Conference in Bath, United Kingdom. This conference is among the well known accounting conference held annually around UK and I have the opinion that all accounting PhD students should take the opportunity to attend to the conference, submit your research paper, and get many insightful inputs to further improvise our research. I did and yes, out of attending the conference, my thesis again extended to better one. I was fortunate again to be able to join and presented my research paper there. Back from the conference, I discussed with my supervisors and added moderating variable which I never did in my research life. That was the difficult time for me (actually not so difficult) and Allah never go away from me, He brought Dr Intan and Dr Wan Sallha to guide me about the moderating variable. 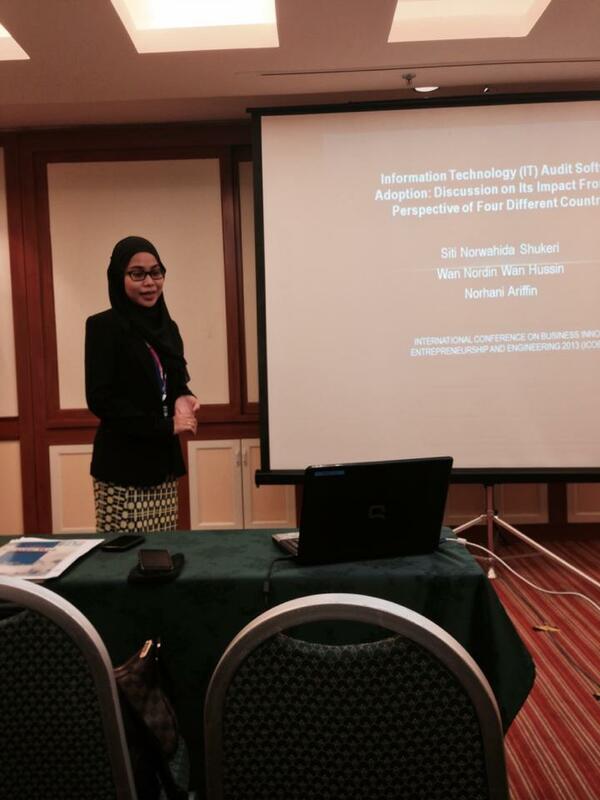 Ahamdullilah, everything was clear and my finalized thesis was almost done for final review. Ofkos there are some technical things to be revised to my thesis, but it was minor. Prof Dr Wan has been so helpful to me throughout my study. To tell you the truth, I had meeting with him almost every week since 2014. If not every week, at least once in two weeks. Lucky I'm not working on Sunday, so I can go to UUM without taking any day off. But towards the end of my study, I used to go to UUM during weekdays as well (only during my off-class time). I like the tune that we meet often, so that my thesis will not be a frozen one. I'd like to advise, those who are still struggling with your PhD, meet your supervisor as often as you can. Otherwise, you'll be doing nothing and at the end of the day, you will realise that your research doesn't progress much. Supervisor who are honestly supervise you, want to do research with you excitedly, they will not giving you many excuses to meet them, because they are excited about our research. My supervisor is one type and again, Thanks Allah. Actually, there are many outstanding quality about Prof Dr Wan and another one is about his English proficiency. I think we, young generation has to agree that senior professors really have good English proficiency. I have to admit even though I was from IIUM (bachelor + master), my English is far from proficiency's perfection. 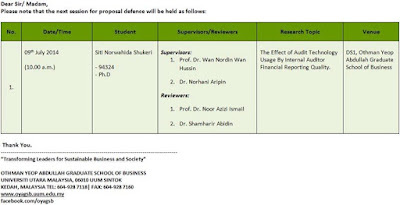 So proofreading was the alternative, yet Prof Dr Wan do proofread my thesis especially Chapter 1, 2 & 3 and I was totally impressed with the finalized one. He once said, make people impress with the beginning story, make them interested to further read our thesis, and who disagree isn't? So, August 2016, I submitted my finalized thesis for PhD viva-voce and on 22 December 2016 (it was about 4 years 3 months duration, to me it's an achievement for part timer), I have passed defended my thesis with minor correction and, my thesis has been approved by the university senate to qualify me as official Dr Siti Norwahida binti Shukeri. All praises be to Allah. After all, no words can be voiced to my husband who are always with me in ups and downs time. He is the one who encouraged me to register my PhD. He is the one who look after my two kids (Aishah + Akif) while I'm busy progressing my study, meeting with supervisor and attended conference and seminars. He is my total strength and without him, no PhD for me. Thanks Allah for giving me such a wonderful husband which no one can replace him to be who he is, Dr Wan Mohd Khairy Adly.